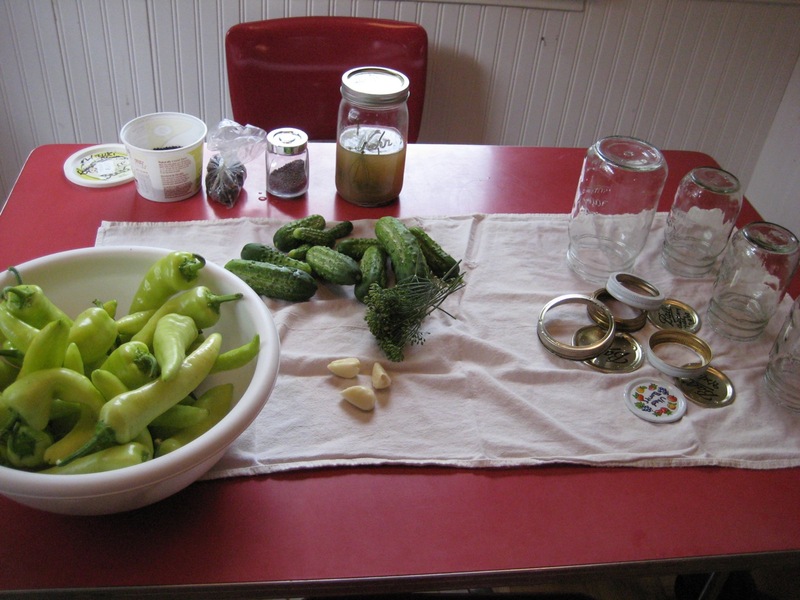 Here it is, our Nourishing Traditions-inspired pickle recipe (by request from several people). This isn’t a recipe so much as a method — because really it could be varied quite a bit and it would still turn out great. 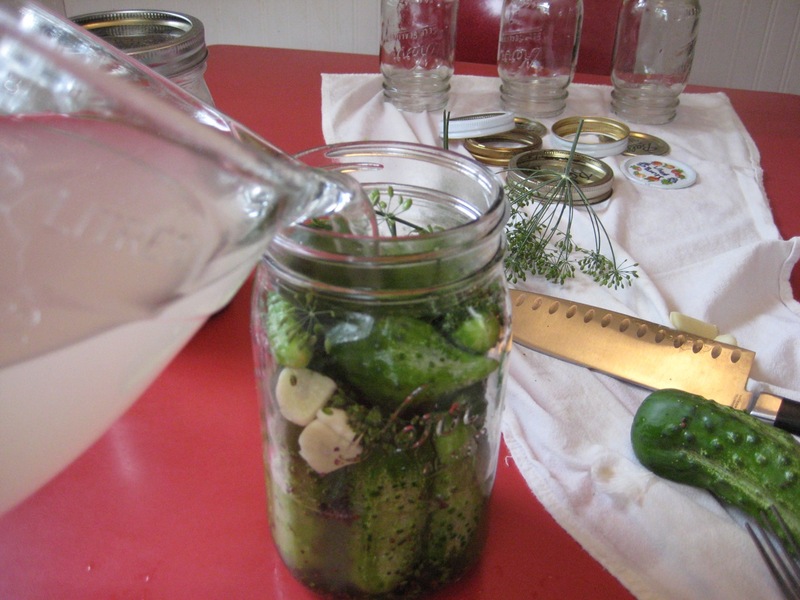 I like to use smallish whole, unsliced cucumbers for pickles — they stay crisper that way. These are dill pickles, but with a more nuanced, subtle flavor than store-bought dills — imagine a dill pickle without that strong vinegar taste. Sprinkle some mustard seeds, garlic, dill, and cloves at the bottom of a quart-size jar. Fill the jar half full with cucumbers or sliced peppers. Layer in more of the spices, dill, garlic. Fill the jar the rest of the way with the cukes or peppers, leaving about 2 inches room at the top. Throw in whatever’s left of spices. Pour in the whey then top off the jar with brine until the pickles/peppers are covered. Cover tightly and leave on the counter for 2-3 days. Taste a pickle or pepper. Does it taste really great? It’s done. Is it a bit salty? Leave it for another day then try it again. When they’re done, transfer to the fridge. They will keep several months, at least. 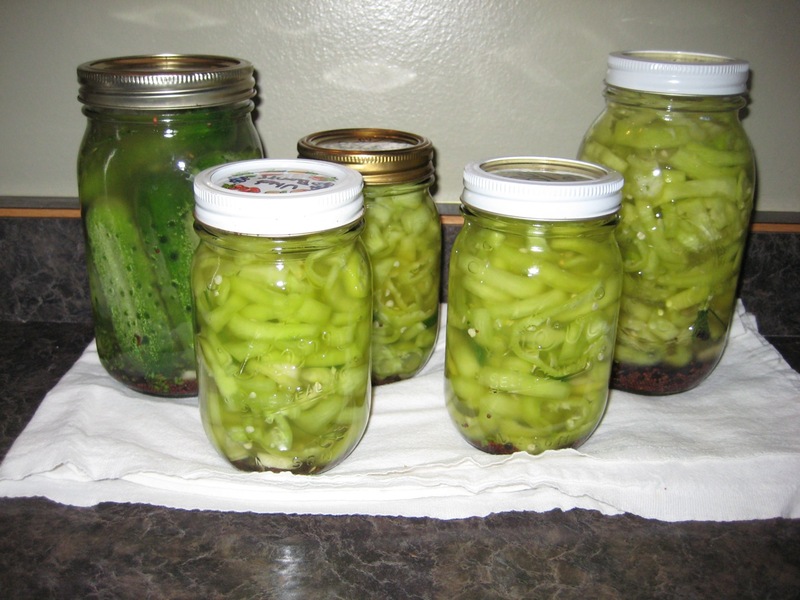 Variation: when you hit the height of pickle season, and you’ve made a few batches of these already, you will have a half-full jar or two in your refrigerator. Instead of messing around with making more whey every time, we use a good cup or so of the liquid from the half-eaten pickle jar as an “innoculant” to get the new batch started. Sorta like a sourdough mother, except with pickles. Lazy woman’s variation: OK, to be perfectly honest, I leave out a lot of the spices when I make these. And they still turn out great. For banana peppers in particular, I like to keep it very simple and just add garlic and peppercorns to the mix. Adam made some pints of the peppers, as well, because we have several requests for samples. Categories: Cooking and baking, Practical, Yeast/Fermentation | Tags: Fermentation, garlic, Nourishing Traditions | Permalink. 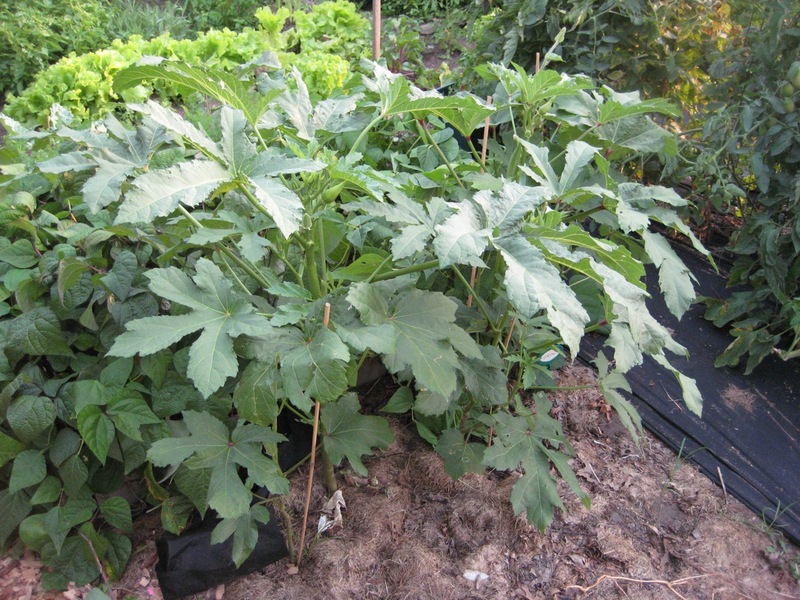 4-5 okra plants, from above. Lots of baby okras coming in. Another view. The plants are about 2.5 feet tall right now. 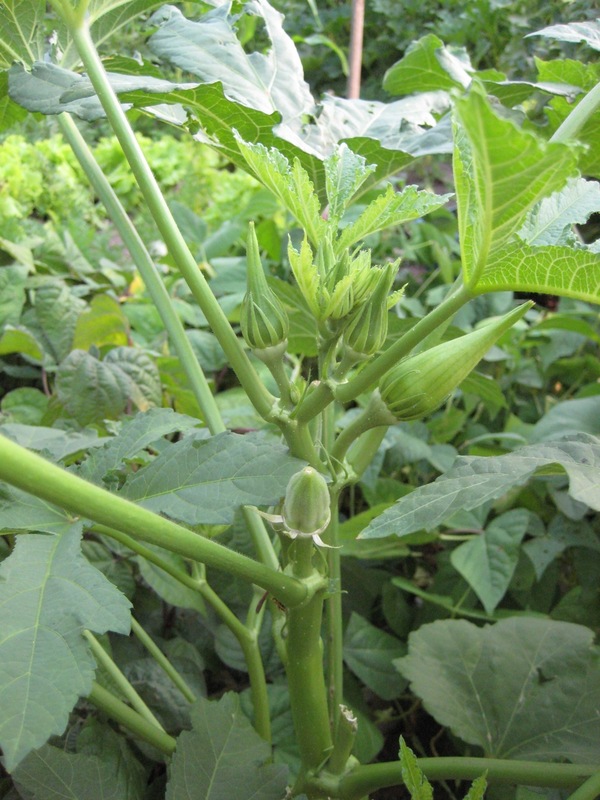 The seed packet said that they would be 4 feet tall, but I don’t know if that’s possible in Minnesota (okra is a tropical plant). 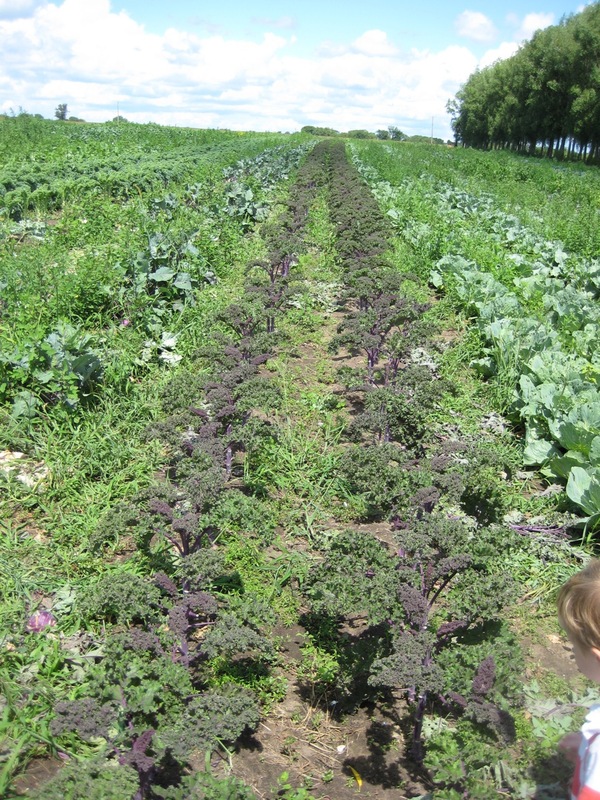 We direct-sowed seed and also put in a couple of plants that we had started inside, and there is very little difference between the two right now. 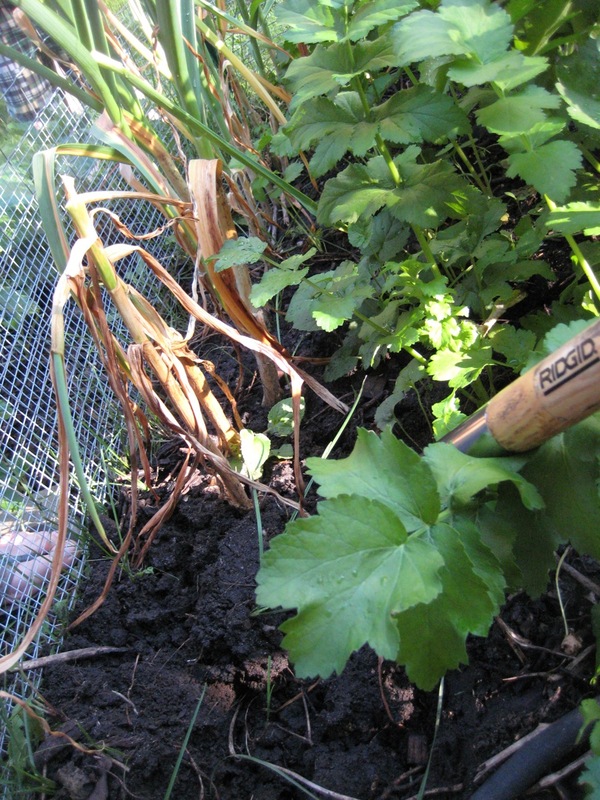 The seed packet also said to stake the plants, but I haven’t found that to be necessary yet. 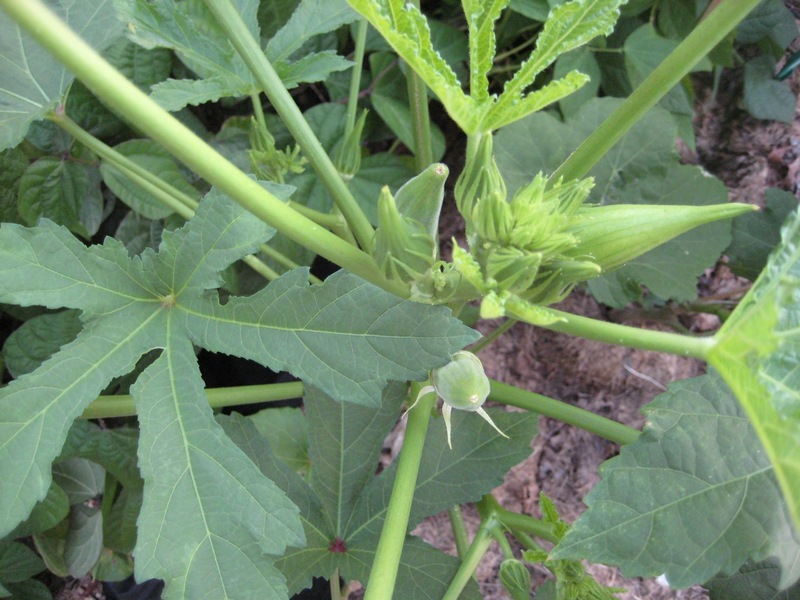 I love to eat okra, so I might try it in my own garden next year. My recommendation would be to find room for at least 6-7 plants, if you’re going to grow it. The production has been a little uneven so far, and some pickings have only resulted in 2-3 pods. Not really enough for a meal. That looks like it’s going to change soon, though. 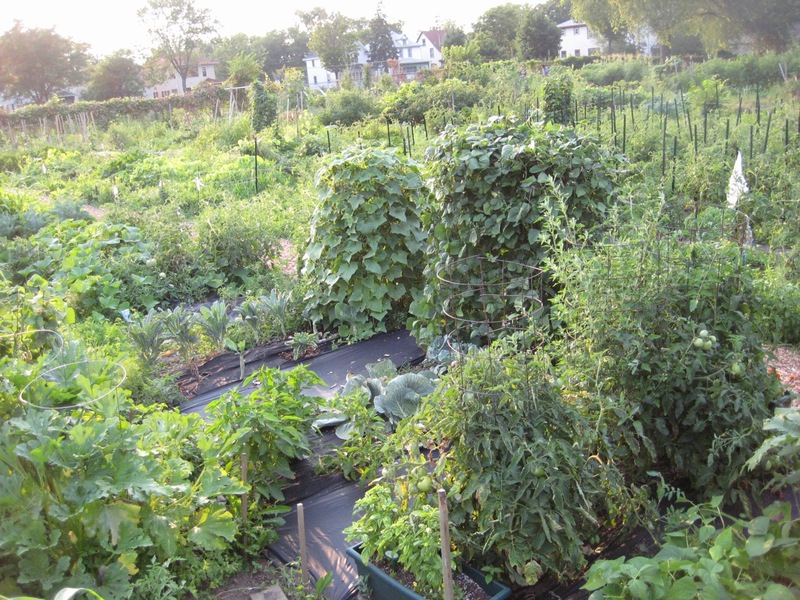 If you’re ever near 38th St. and 35W in Minneapolis, I highly recommend visiting the Sabathani garden (behind the community center). 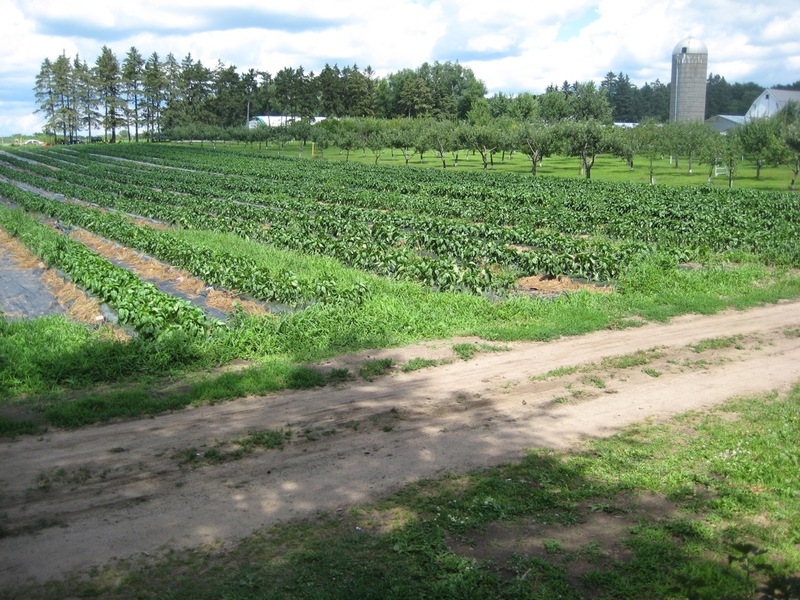 It is a really cool place right now; lots of innovative gardening going on there. 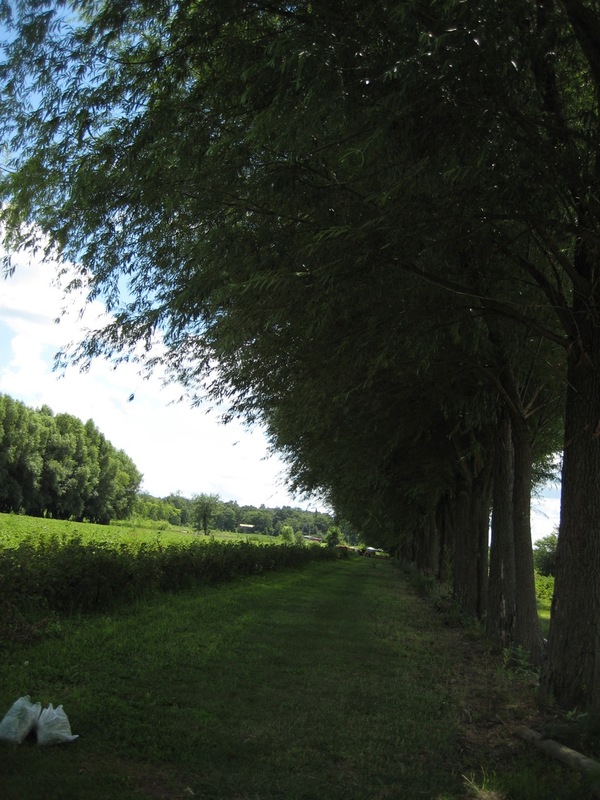 Categories: Community planning, Gardening, Practical, Theoretical | Tags: okra | Permalink. 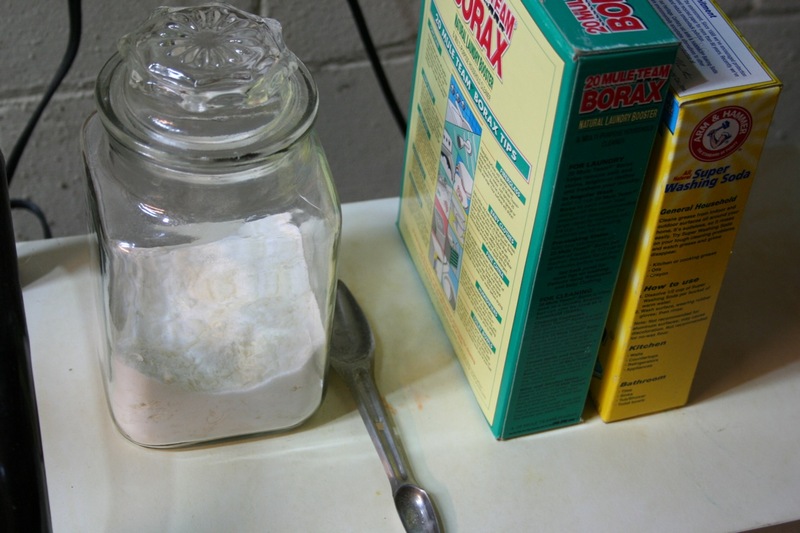 As promised, here’s the recipe for homemade laundry detergent. We’ve been using this for a few weeks now and absolutely love it. It’s cheap to make, works great, and is non-toxic. We do a lot of laundry, and this recipe seems to be lasting a long time. The only ingredient I wasn’t sure about was soda ash, but I’ve done some looking around and it doesn’t seem to be anything to worry about. Please, correct me in the comments if I’m wrong. Use 1 heaping tablespoon for a large load of laundry. We got a lavendar-scented bar of castile soap and the resulting laundry powder smells heavenly. Apparently castile soap is not totally necessary for this to work (see this recipe), but it’s really nice to use something biodegradable at least. I was really fortunate that Christina did all the legwork for me finding a nearby store (Uptown Rainbow Foods) that sells soda ash — it can be hard to find. It is really cheap, though; I think it was less than $3 for a large box. Apparently, if you have a hard time finding washing soda you can call this hotline: 1-800-524-1328 and have the UPC code 33200-03020 and give them your ZIP code and they will tell you stores near you that have sold it in the past 90 days. And with that I’ve eliminated yet another non-recyclable plastic item from our home (Minneapolis doesn’t recycle plastic bottle caps). Plus, this is cheaper than the 7th Generation laundry detergent we’d been using. 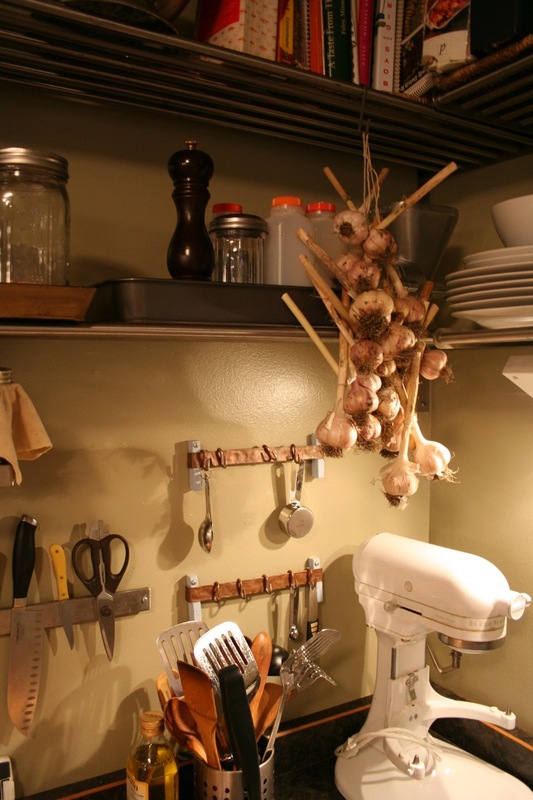 Categories: Practical | Tags: recipes | Permalink. Is conventional antiperspirant, which contains aluminum, bad for you? Hard to say for sure. The government says they can’t definitively link it to breast cancer, but they also admit that the aluminum and parabens are, in fact, absorbed into your bloodstream, albeit in small amounts. There are rumors of aluminum being linked to Alzheimers. I haven’t seen anything really definitive, but on the other hand I’d rather not risk it, if safer alternatives exist. Enter the all-natural deodorant market, with products like this or Tom’s of Maine or Herban Cowboy (lol). Adam and I have tried some of them, and they work all right. But they are expensive, and you still have a non-recyclable piece of plastic to deal with when you’re finished. 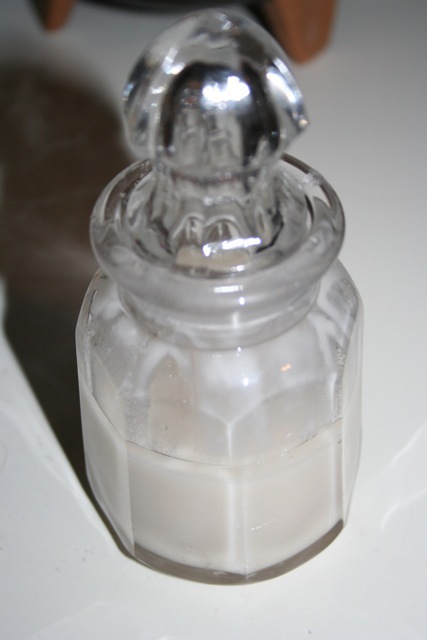 I tried two different recipes for very inexpensive homemade deodorant. Which one is best? That depends. I just put the ingredients in a half-pint jar and shook it up. EASY. Worked better after I increased the baking soda. This is the cheaper of the two recipes. Mix the ingredients together and store them in a super cute little jar. 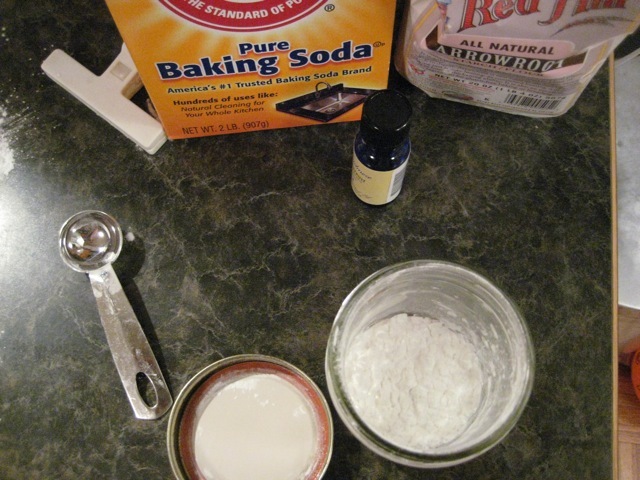 If it seems too runny, add a little bit extra baking soda and arrowroot powder in equal measures until it reaches a consistency you like. You only need to apply a small amount to each arm. – Only recommended for people who shave their armpits — otherwise the oil will stick to the hair and soak through your t-shirt and look awful in general (fortunately it did not permanently stain Adam’s favorite t-shirt–he’s a good sport for trying). – During really warm weather (room temp. above 80 degrees F), it takes on an oily, liquidy form. It doesn’t gross me out, but nothing grosses me out. – It smells like coconut. In general, I liked both of these deodorants. The coconut one worked a bit better, but the powder was easier to take with me–these are the kind of deodorants you will definitely need to re-apply after exercise. But they work just as well as those plastic-encased co-op ones. Please, do not expect the performance to match store-bought antiperspirants. Here’s how antiperspirants work. One less thing I have to buy at Target? Check. One less item for the landfill? Check. Update, 9/26/2012: I’ve changed the recipe for #2. I now use 1 T. olive oil and 3 T. coconut oil during the colder months of the year. Otherwise, it can be hard to scrape out (if your house gets anywhere near as cold as mine does). First ripe tomato of the year. Too bad I didn’t notice the blossom end rot until I picked it. 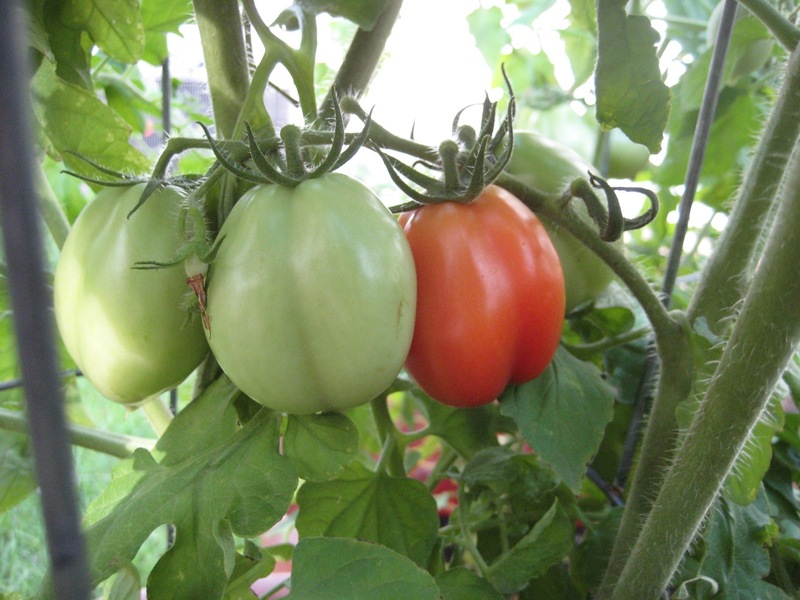 I checked the plants carefully and removed every affected tomato, and am now watering the potted tomatoes every day so hopefully that will be the end of it. 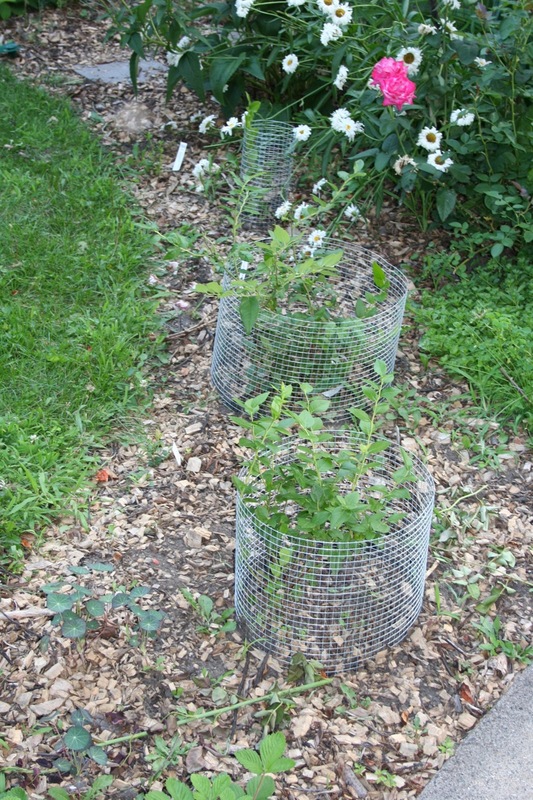 I put these small, basic cages around the blueberry bushes. It won’t completely keep the rabbits out, but hopefully will discourage them. 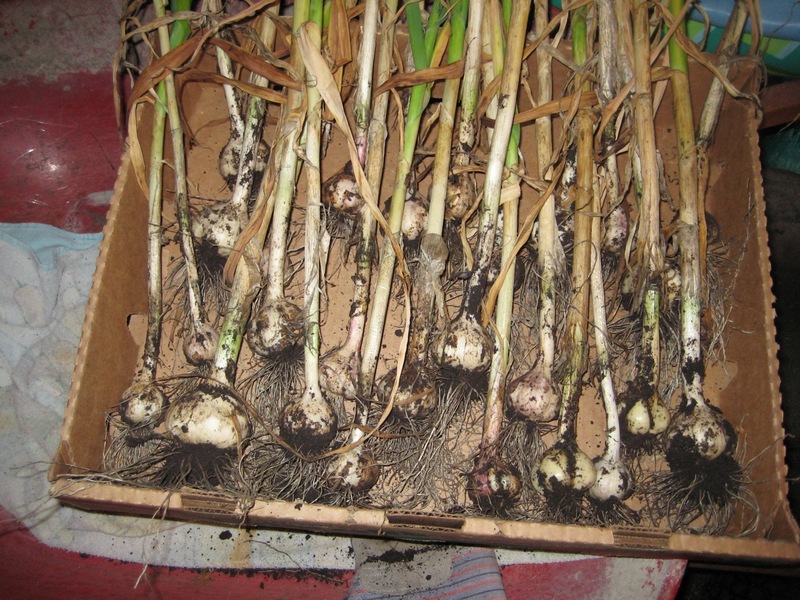 Our garlic finished curing in the garage, so Adam cleaned it up a bit further, trimming up the tops and roots a bit and brushing the dried dirt off. Then he hung them with string in the kitchen. 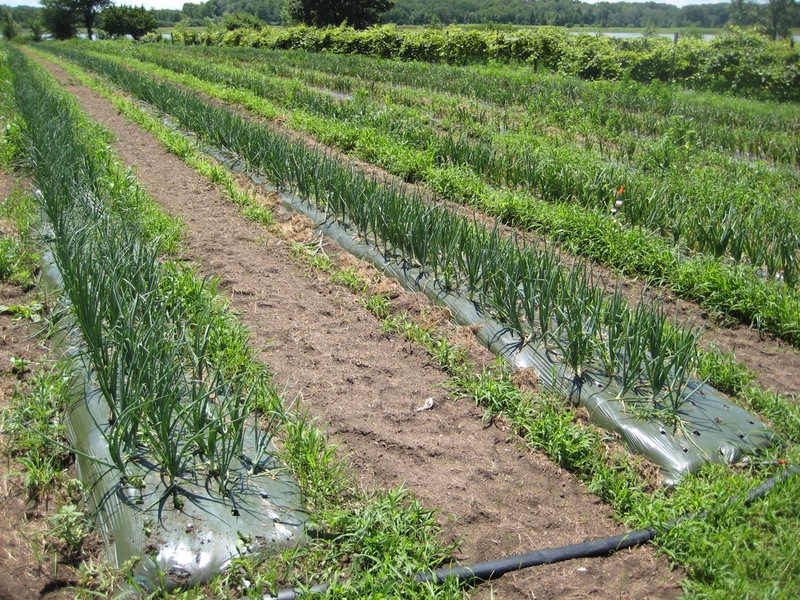 Here in USDA zone 4, we have to grow hardneck garlic, so it’s not possible to create the attractive garlic braids that you often see from softneck garlic. 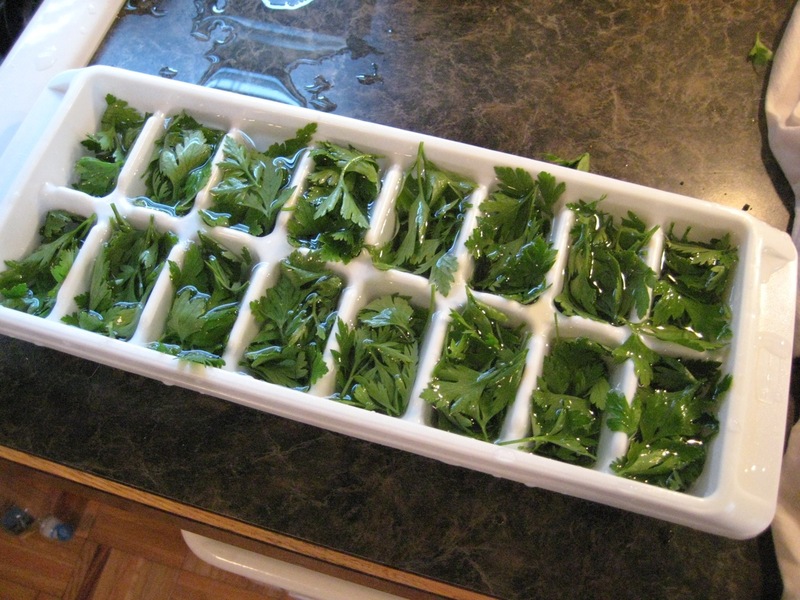 We have a LOT of flat-leaf parsley right now so I tried the freezer method: loosely pack fresh herbs into an ice cube tray, cover with water and freeze. Should be really easy to throw one of these cubes in a pot of soup this winter. 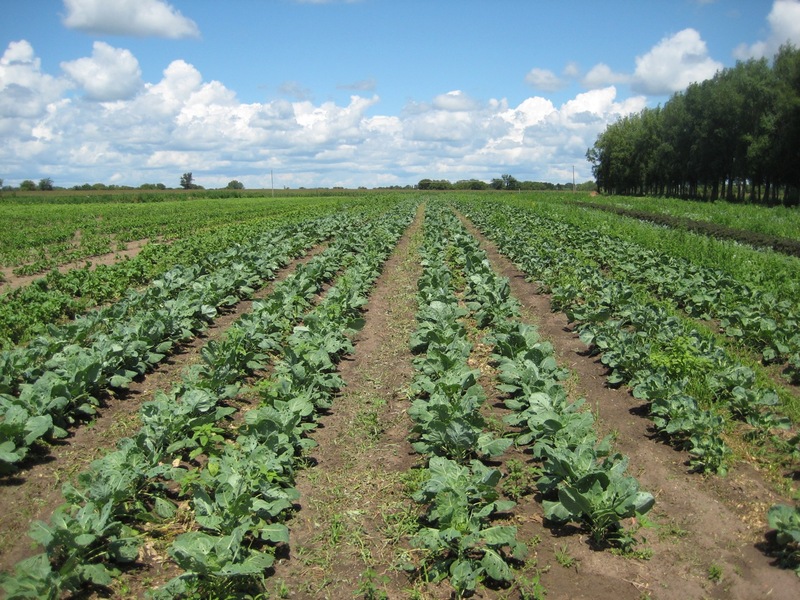 – cabbages are starting to form heads! Categories: Gardening, Practical | Tags: beans, garlic, raspberries, tomatoes | Permalink. 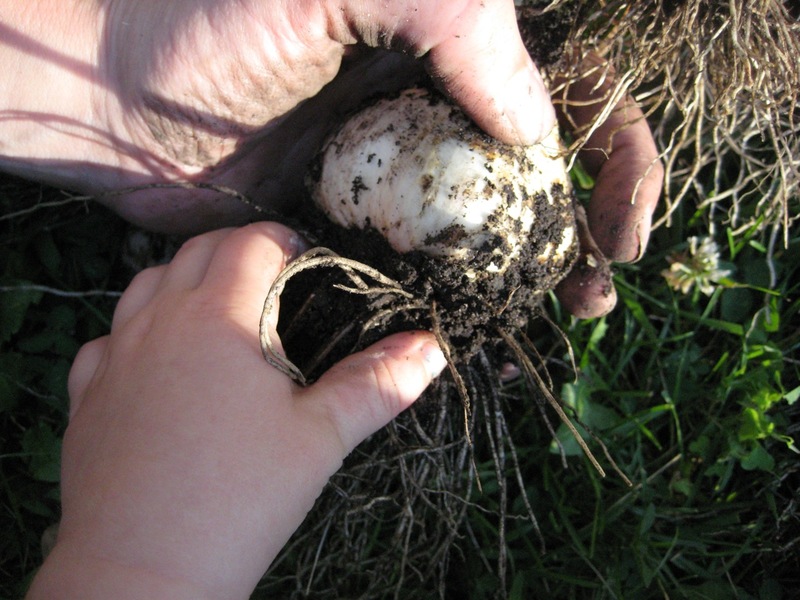 We harvested our garlic tonight. The kids even helped. It was a little bit of a surgical maneuver to get them out without harming the parsnips which are right next to them. Adam got underneath them with the fork and I dug through the loosened mud (it rained today) with my fingers and pulled them out. Then the kids stacked them up on the grass for us. Here’s our whole haul, drying on a piece of cardboard in the garage. It will cure there in the garage for two weeks, and then I’ll clean it up a little further and bring it in to the house. There is absolutely no way this will last us the winter, but we’re probably good for a couple months. We grew some of it out in our flower beds as an experiment this year. It looked really nice and — most importantly — the rabbits had no interest in eating it. I plan to expand next year. Well, really, I plan to expand everything every year. 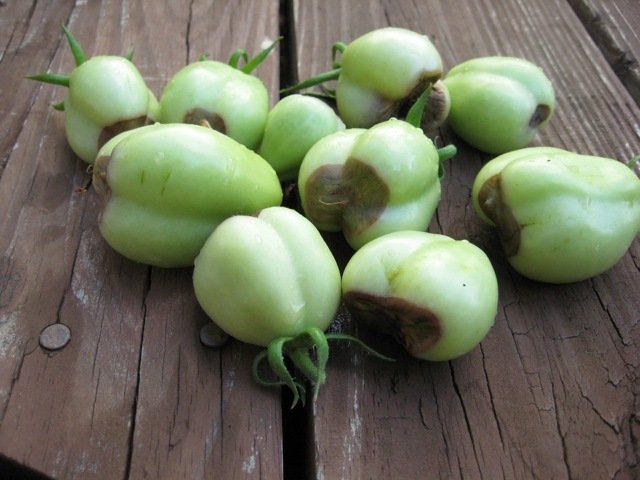 In other news, I lost a good 1/4 of the tomatoes on each of my potted tomato plants to blossom end rot. My own fault for not remembering to water them daily. Potted tomato plants dry out so much faster. We’ve been getting a lot of rain but apparently not enough for the potted plants. 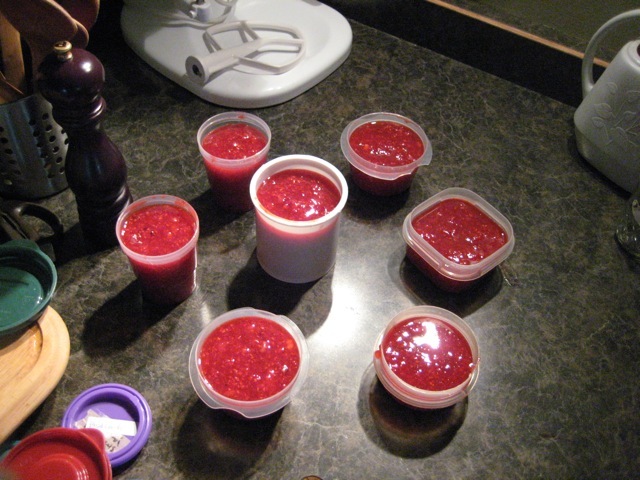 Finally, I tried making raspberry freezer jam today. Boy howdy was that easy. Mix some crushed up berries, sugar, and pectin, let it sit for 30 minutes, put it into containers and freeze. It was a very productive day; we also made yogurt, butter, and 4 batches of pesto which are also cooling in the freezer now. Coming later this week: PICKLES! 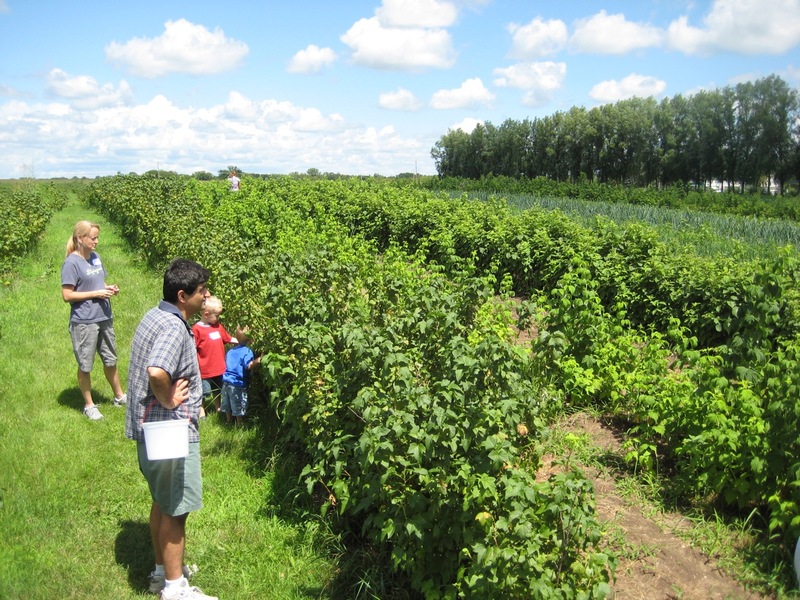 Categories: Gardening, Practical | Tags: garlic, raspberries, tomatoes | Permalink.